Ram rumbles into the Woodward Dream Cruise. Chrysler is unleashing another swarm of gaudily attired Ram pickups. The Rumble Bee concept was unveiled Saturday at the Woodward Dream Cruise north of Detroit. The bright creation has splashy yellow paint, a black racing stripe that runs the length of the truck and of course, bumble bee graphics inside and out. 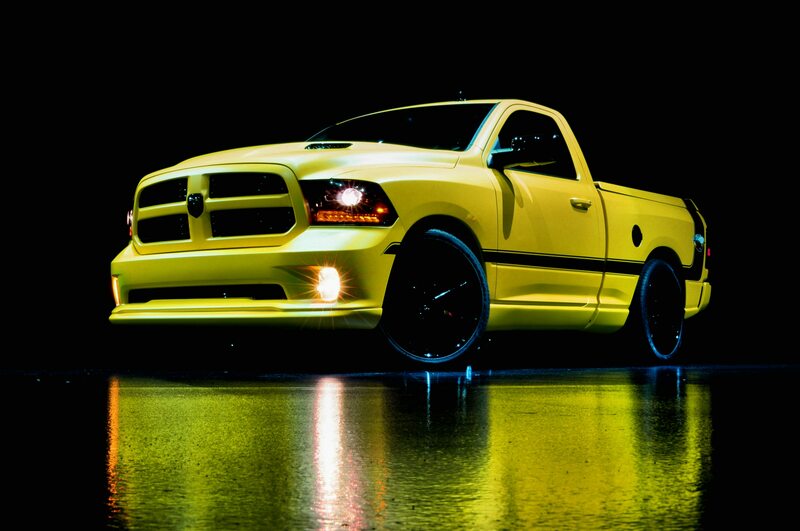 The new truck is a concept meant to celebrate an earlier batch of Rumble Bees sold in limited numbers a decade ago. There are no plans for production of this modern Rumble Bee, but a spokesman tells Automobile reaction at the Dream Cruise could change that. The Rumble Bee is based on a two-wheel-drive 2013 Ram running the stock Hemi V-8 pumping out 395 hp and 407 lb-ft of torque paired with an eight-speed automatic transmission. Ram then dresses it up with “drone yellow” (yes they really call it that) paint, a Mopar ground-effects kit, 24-inch wheels and gloss black accents on the hood, vents and dual exhaust pipes. Inside, Rumble Bee lettering and logos trim the seats, doors, and floor mats. But the best, and weirdest feature by far, is a real bee mounted into the shift knob. The appearance alone makes it hard to miss. But just in case, Ram engineers added two settings for the exhaust, allowing the driver to bypass the catback system and simple crank up the engine volume. There are two settings. Loud. And louder. No buzzing here—the Rumble Bee is sure to live up to its name.